EUR/USD - 1.1305.. Euro met renewed buying at 1.1214 at the start of last week n rose to 1.1288 Wed b4 briefly dropping to 1.1230 on dovish ECB's Draghi but on to rally to a 2-week high of 1.1325 Fri on active eur/yen demand. On the bigger picture, despite euro's resumption of LT rise fm 2017 near 14-year bottom of 1.0341 to a fresh 3-year peak of 1.2555 in mid-Feb, subsequent selloff to 1.1216 in Nov 2018, then to a 20-month bottom at 1.1177 in early part of Mar confirms said major uptrend has made a top there. Although price fell fm 1.1448 to 1.1184 initially in Apr, subsequent rally to 1.1325 suggests the volatile price action fm 1.1177 may be unfolding into a bearish triangle n as long as 1.1448 holds, another 1.1120/30 is seen, 'bullish convergences' on daily indicators should keep price abv 1.1054 (61.8% proj. of 1.1815-1.1177 measured fm 1.1448). 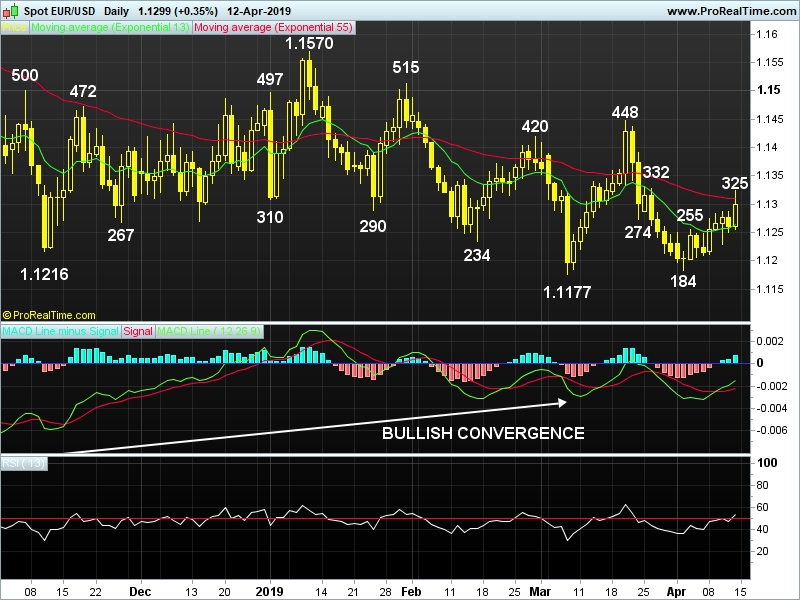 Only abv 1.1448 risks stronger gain twd 1.1570 in May. Today, although euro's retreat in NY after Fri's impressive rally to 1.1325 would bring initial consolidation, as long as 1.1281 holds, recent erratic rise fm 1.1184 would head to 1.1375, 'bearish divergences' on hourly indicators should cap price at 1.1400. Only below 1.1250 risks 1.1230, then 1.1206/10.